I have been lucky to connect with the amazing Mel (of Mel’s Desk) at past conferences, and she has been gracious to host some story time deep dives, at the Networking Uncommons, where attendees can come and chat about story time and youth services and brainstorm answers! If you are unfamiliar with Networking Uncommons it is a free space like a makeshift empty meeting room with tables and chairs to have informal meetups or just hang and chat. There are some art supplies and button makers if you feel the need to do some crafting! 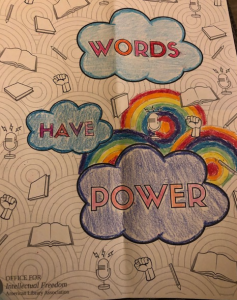 See my awesome coloring page from the Office of Intellectual Freedom that I started during this meetup! This year, the spot is super hard to find– across the street from the convention center and away from all the action of midwinter. But, we were joined by one other children’s librarian, and for 2 hours we chatted about the differences in our systems and how we present story time… and it was really enlightening. We also tried to workshop some new ideas for one of my programs— thinking about how to instill mindfulness and quiet exploration for toddlers… is it impossible? Well, we shall see! They gave me lots of good ideas… and I think we all walked away with some new ideas and an appreciate for the work that we do.